An interesting new form of signage recently appeared in our cities. See this example in Geneva: few weeks ago, letter boxes in Geneva featured stickers telling people that they will be moved. Interestingly, as shown on the example above, the message was not just a message from the Swiss Post telling me that "The letter box will be moved to XXXX". Instead, there was a speech bubble expressing that "I am moving" to show that letter boxes were in the process of being transferred to a new location. 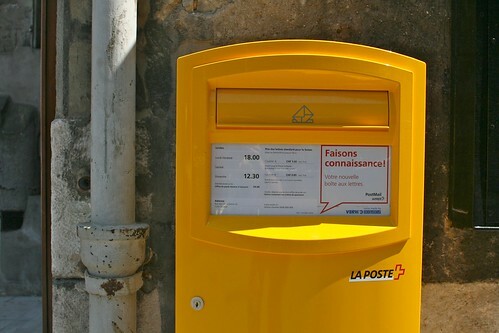 Then, this week, a brand new yellow box was located in the announced place; and it featured another message: "Let's know each other" with two signatures: "Your new letter box" and "Postmail". 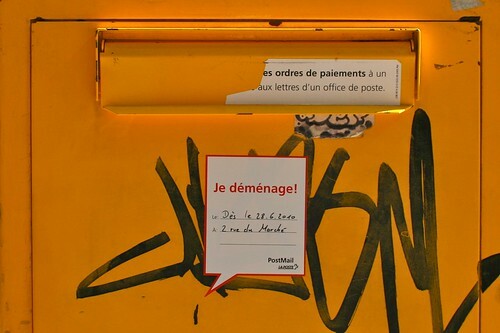 The fact that the message is given from the letter box perspective (see the use of the first person and the term "relocation"), as if the object was given a form of agency by the Post institution. I don't mean here that objects never had agency but let's say there is a stronger acknowledgement of what is delegated to the object. The use of the speech bubble meme also reinforces this trend. The temporal aspect of this is strikingly curious: from the relocation announcement to the new place, there are different ways to interact with the box. First people need to know that their old pal will move and that a new one will be located in a different place (see the new box design). Why do I blog this? these observations led me to wonder about how service design is evolving. New metaphors are being employed and it's curious to run across them in a city. Beyond this, I am also intrigued by the way objects are more and more anthropomorphized and how people perceive this sort of communication. Overall, my intuition is that this sort of communication is far more effective than what robot designers are putting in place. It's IMO another example of using basic means to convey certain messages (see recent examples). Finally, this kind of observation shows that there seem to be a common thread in my interests lately: human-object interactions (human-robot interaction? ), artifact agency, user's understanding of objects, etc. Surely some good material for projects about robots, networked objects and blogjects. What is funny and relevant here is to think about how to give objects agency using basic elements such as smiley faces (Gerty) or speech bubbles. Will this be a new idiom for objects? Should robots look like human/animal or should they be stay as things and communicate through simplified devices? Let's discuss this with friends in the robot industry.